Website answers one dumb question: Is This Band Name Taken? There are only so many ways to put together words, especially if those words are just “the” and a plural noun. Thus, there are a finite number of band names. Fortunately, the Internet has figured out a way to help fledgling artists suss out whether a band name is available before they’re forced to change it. That way isn’t Google (though, duh…). 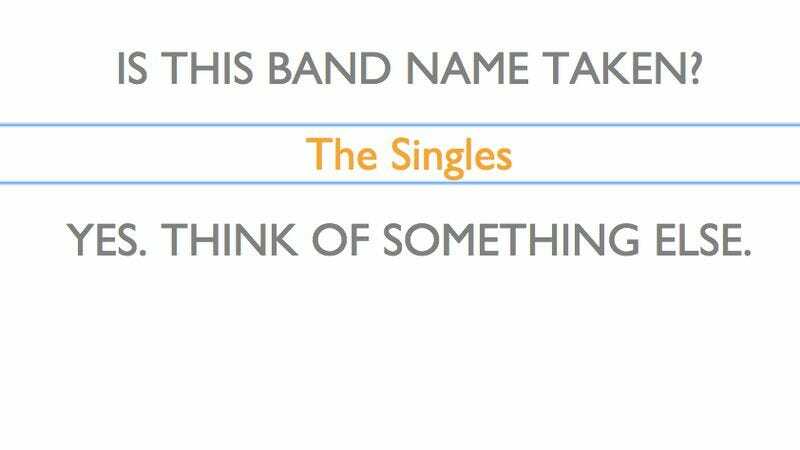 Instead it’s Is This Band Name Taken, a new single-purpose site that answers that one simple question. Want to call your band The Singles, Scarlett Johansson? Think again. Thinking about using the handle Twigs? Don’t, or you might be forced to add that “FKA” up top. Someone’s even grabbed The A.V. Club, thus killing our staff band dreams. Corncob’s available, though the site encourages groups considering that name to “get good fast,” thus ensuring they’ll have the rights to that moniker.